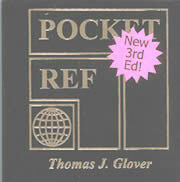 Compiled by Thomas J. Glover, 2nd edition. Sequoia Publishing Inc.
A book with thousands of hours of research and hard work. This book contains almost every information that one needs to know, right on the fingertip, without searching hour after hour. Book measures 5⅝" x 3¼" x ⅝" thick with 542 pages and a soft cover. Highly efficient solar panel requires only 50 lux, works with any available light. Will never need batteries. 10 digit LCD + 2 digit exponent. 15 levels of parenthesis. 67 functions including all the preprogrammed functions of Large Display Scientific Calculator 830003 Plus; binary, octal decimal, sexagesimal, and hexadecimal conversion, and standard deviation. Comes with a soft carrying pouch, instructions and a button cell battery. Dimensions: 5¼" x 2¾" x 7/16" (133 x 70 x 11 mm). Professional grade U.S. standard to metric conversion calculator. 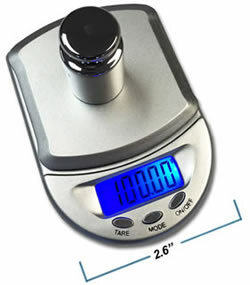 Carry anywhere for U.S. to metric and metric to U.S. conversions of volume, area, length, weight or temperature. Also functions as a standard calculator. Results are easy to read on the large 8 digit display. Solar powered with a back up battery for use in low light areas. Automatic power off. Comes ready to use in a hard folding case with full instructions and button cell batteries. Dimensions: 5" x 3" x ½"
At last, a GREAT Conversion Factor Handbook! High accuracy with 0.01 pH resolution. Automatic, one or two points calibration. Battery life: 1,000 hours of continuous use. Wide range: 0.00 to 14.00 pH. Piccolo is a revolutionary pH-meter with a 4-in-1 "Electrode + Amplifier" design. Conventional pH meters are susceptible to the weak high impedance signal which makes the electrode, connector, cable and meter delicate and vulnerable to noise, humidity and dirty environments. Piccolo has overcome these problems with a pre-amplified electrode delivering a strong signal to the meter. Piccolo has the same precision as a lab-grade meter with a resolution and accuracy of ±0.01 pH, at a fraction of the price. Easy to use: Battery operated and weighing only 100 grams. Replacement Electrode: The detachable electrode has sealed electrons to protect from humid and dusty environments. Temperature Read-out: A thermometer built inside a pH meter! Accurate temperature read-out directly on LCD. Piccolo Plus comes complete with a 4-in1 Ph electrode, pH 4 and pH 7 buffer solutions, a small calibration screwdriver in a rugged carrying case. Measurement of pH value is possible even in unbuffered or very weakly buffered solutions, since the sticks can be left in the solution until the final color change is completed. Colors of the individual color fields cannot run into each other, thereby allowing for a more precise comparison with the color scale. Recently developed indicator dyes guarantee a sharp differentiation between the individual pH values and a clear and easy comparison to the color scale. 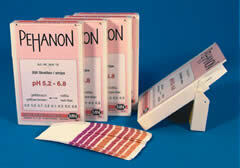 Sample application – four different indicator papers 6x5 mm are sealed on to a plastic strip 6x85 mm. The strips are sufficiently long to avoid contact between the fingers and the test sample. 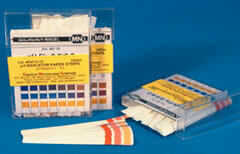 pH-Fix™ Indicator Sticks are packed in a box of 100 sticks 6 x 85 mm. This is a series of pH indicator papers where the indicator and color scale are combined on a single strip. They permit a fast, convenient and accurate pH value determination since they eliminate the necessity to compare color against a separate scale. This presentation also permits the pH measurement of colored solutions and suspensions, since the color of the test solution acts on the comparison scale in the same manner as on the indicator field. The PEHANON® series covers the entire pH range from 0 to 12 with one universal paper and 13 narrow ranges which overlap to permit the user utmost selectivity for the range suited to each particular need. The indicator zone (unprinted field) is in the center of the strip, the comparison fields above and below same. The strip is submerged in the solution for about three seconds so that all colors zone are wetted whereby the center field changes color according to the pH value of the solution and is then compared against the color filed bearing the corresponding pH value imprint. An invisible hydrophobic barrier just above the top color field prevents capillary action of the test solution beyond that point and corrosive, toxic or otherwise noxious liquids to not come in contact with fingers which remain clean and dry. Strips are packed in a plastic box, containing 200 strips. Large ⅞" high digits and lightweight design make this pH meter ideal for both field and lab applications. Simple to operate and works with any electrode with a BNC connector. Measures the full 0 to 14 pH range with a high 0.01 pH resolution. Features 2-pt. calibration, hold function, fold-out easel back and a tripod screw. Comes with a 9V battery, calibration tool, and full instructions. temperatures of 23 ± 5°C. 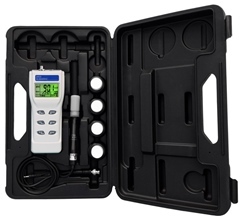 Includes everything necessary for immediate field use: Basic pH Meter, epoxy body, sealed reference combination electrode with a BNC connector and 2½-ft cable, pH buffers 4 and 7, deionized water, instructions, 9V battery, hard carrying case. Reads either pH (in 0.01 resolution) or mV in large digits, with time, date, and temperature (in °C or °F) shown simultaneously on the lower display. Also indicates stable reading, low battery and displays calibration data. Scroll 99 data points with time stamps and min/max readings directly on the backlit LCD. Features hold, up to 5 point calibration, N.I.S.T. buffer recognition, manual or automatic temperature compensation, and a USB port. Comes with 4 AAA batteries. Will accept any pH or ORP probe with a BNC connector. Advanced pH Meter Kit includes: Advanced pH Meter 850055 in a hard carrying case complete with a detachable temperature compensated pH probe with 3½ ft cable, pH buffers 4, 7, 10 and distilled water. 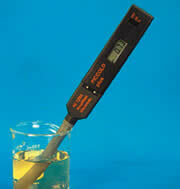 We offer a wide selection of pH calibration and buffer solutions. Always choose a pH 7 buffer plus at least one other pH value close to your expected measurement range. Using solutions of known pH value allow you to adjust the system to read accurate measurements. Calibration should be performed before each reading or each set of readings. pH buffers allow you to adjust your testing system to measure your samples' unknown pH more precisely. Perform standardizations with fresh buffer solutions. Never pour used buffer back into the bottle; always discard after using. Match the temperature of the buffer to the temperature of the samples. For example, if your samples are at 50 degrees Celsius, warm your buffers to 50 degrees Celsius using a beaker in a water bath. Cover the entire 0 to 95% Brix range with one instrument, along with nD (refractive index), temperature, and dextran, fructose, glucose, lactose, and maltose scales. Housed in a protective rubberized IP65 Waterproof case to safeguard the electronics from wet environments, which also makes for easy clean ups. A scratch proof sapphire lens ensures continued accuracy over time. Measure samples as small as 1 ml, in the field, with laboratory accuracy. Sample temperature is initially displayed on the large LCD followed by the measurement results. The sophisticated microprocessor provides automatic calibration, automatic temperature compensation and automatic shutoff (after 3 minutes). Features one button calibration to distilled water and indicates when the battery is low. Powered by a rechargeable, long-life, Li (Lithium Ion) battery providing 50,000 tests or about half a year use on a single charge. Comes ready to use with instructions, carrying case, transfer-pipet and an AC power adapter. Perfect for use in fume hoods, environmental studies, or for air flow check. A highly accurate, hand-held unit, only 3 ozs. Allows you to select readout in knots, feet per minute, meters per second, or miles per hour. To insure maximum sensitivity and accuracy, the turbine is suspended on saphire jewel bearings, and its rotation is sensed by an infrared light beam, which adds no friction. The resulting signal is pro-cessed electrically by an LSI (Large Scale Integrated) circuit. Powered by 3 "AAA" batteries included. Measurements: 4.5" x 2.5" x 1.5". 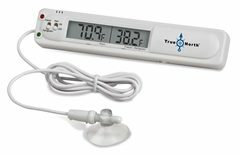 The compact Food Safety Thermometer offers both surface and internal temperature readings in one portable convenient unit. Instantly check the surface temperature of food with the single push of a button using infrared technology. The built-in bright white flashlight helps illuminate the surface being measured. When regulations demand compliance to internal temperature such as with prepared meats, fish, or poultry, simply fold the penetration probe out to any angle, and read internal temperature on the large backlit LCD display. Programmable high and low alarms enable easy spot-checks for food safety. A fully sealed IP65 waterproof housing stands up to the rigors of food service and helps your establishment meet HACCP and FDA's Food Safety requirements. Comes complete with clear instructions and 2 x AAA batteries. Protect chilled and frozen samples from potential spoilage. This freezer thermometer will monitor temperatures inside your refrigerator or freezer, with sound and flashing LED lights to alert you of out-of-range temperatures. Digital Hourglass offers the simplicity of an hourglass by starting the count down as soon as it is turned over. Unlike a sand hourglass, however, the duration of the count down is adjustable to any interval between 1 second and 100 minutes. As the timer counts down digital sand flows from the upper to the lower part of the hourglass display. The LCD also shows minutes and seconds remaining at the top of the display and minutes and seconds elapsed at the bottom. The flow of the digital sand and the timing sequence reverses each time Digital Hourglass is turned upside down. Upon completion, the original count down setting can be restarted simply by flipping the timer over. Digital Hourglass also operates as a conventional digital timer using buttons on the back. One button cell battery included. N.I.S.T. traceable certificate of compliance available. *Certificate of Compliance Traceable to N.I.S.T. Very accurate with a click stop control button. Large LCD display. Rugged ABS plastic case. It counts up to 60 minutes in 1/100th second resolution. It also has a split interval clock and calculator functions. Comes complete with a leatherette case. Measures: 3"x2½"x¼". Weight: 2.6 oz. A dual monitor for temperature and humidity in one compact and large ¾" digital display unit. Useful for desiccators, incubators, refrigerators, fume hoods, EM labs, stock rooms, clean rooms, chemical storage areas, warehouses, etc. 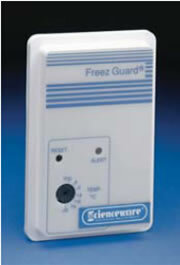 Recalls min/max temperature and min/max humidity readings over any time period. Stand or wall mounted. Comes with two "AAA" batteries which last one full year. Temperature range 0/50°C and 32/122°F in 1°C or F resolution with an accuracy of +/-5%RH (at 59°F to 104°F). Dimensions: 3¾" x 2½" x ½". Weight: 2.8 oz. Count up or down for 100 hours in intervals of 1 second. In the count down mode its unique feature tells you how much time has elapsed after the alarm sounds. Its memory allows for the repeat of a cycle just completed. Alarm clock mode. It comes complete with a built in stand, pocket clip, button cell battery, and magnet. Dimensions: 2¾" x 2¾" x ½". Weight: 1.8 oz. With N.I.S.T. traceable certificate of compliance. 4 independent channels each of which counts up or down for any interval from 1 second to 100 hours. Its extra large display indicates channels that are in use. Each one has a distinctive 1 minute alarm. Automatically begins to count up to indicate time elapsed after count down reaches zero. Its memory recalls last timer setting for reuse. Also has a clock mode. Comes complete with a stand, pocket clip, and magnet. Dimensions: 2⅞" x2½" x 9/16". Weight: 2oz. The Mini Time Tracker offers unique visual and auditory indicators. With two dials, you can adjust the total alarm time and warning time. The total alarm time ranges from 5 min to 2 hrs in 5 min increments. It will count down until the colored light glows and the alarm sounds. Adjust volume or turn off sound for visual timing. Requires three AAA batteries, not included. A unique timer featuring a clear human voice that makes announcements which can be heard from any where within the lab. In the count-down mode, Talking Timer will announce the remaining time every hour, In the final hour, it will announce the time remaining every 10 minutes, every minute in the final 10 minutes, and every second in the final 10 seconds. A choice of 6 distinctive final alarm sounds make it easy to identify which Talking Timer has alarmed should you wish to use more than one. In the dark, in the clock mode, you can touch any button and the Talking Timer will announce the time. You also have the option of turning the voice off. Other features include a large ¾" display with icons to indicate various modes, such as voice off/on, count-down/count-up, etc. Recalls the previous count-down setting for immediate reuse and memorizes other frequently used setting for reuse at any time. Counts up or down to 24 hours. Has a built in stand for bench top use, clips to a pocket, or sticks to any metal surface with a magnetic back. Button cell batteries are included. Measures: 3¼" x 2½" x 1". Weight 2.2 oz. The timer also available with a N.I.S.T. traceable certificate of compliance. There are many possible ways to count – from hash marks in the sand, to highly sophisticated computer programs. For over 100 years, customers have relied on Denominator counters to simplify counting in a wide range of applications. Wherever and whenever you need to take a quick, accurate count, the durable, long-lasting, ergonomic and easy to use Denominator is the perfect solution for fast, accurate tallies. Rugged and reliable, Denominator Tally Counters are appropriate for many Quality Control applications. Counts of rejections can be made by designated categories, either in process or at final inspection. Customers rely on our Denominators for Traffic surveys. The counters are available in any configuration to meet your needs. They may be single- or multiple-mounted vertically or horizontally. Portable counters may be mounted on hand-held clipboards. Our Denominators are rugged for long and dependable service, yet compact and lightweight. Denominators are used in a wide range of laboratory applications, including Hematology, Botany, Geology, Entomology, Oceanography and other medical and scientific laboratory settings. The counters may be banked or tiered, and various mounting options are available to suit your needs. Totalizers are available for use in situations where a cumulative line total of individual counters is required. The Locking Totalizer locks all counters at every 100 counts. A release button quickly unlocks the Denominator for the next 100 counts. Individual percentages can be readily determined by dividing the counter readings by the number of hundreds counted. This feature positively prevents inadvertent over-counting. Non-Locking Totalizers are also available. They continuously accumulate the counts on the individual counters without the operator having to unlock the machine after each 100 counts. A chrome plated with counter with a flange (2½" dia.) for desktop mounting. The recording lever is on the right side and the reset knob on the top. The counter is ideal for serial sectioning work. Four digit place. A Counter with two counting keys each with 0 to 999 range with a single reset knob it comes with removable tabs for top identification. A counter with five keys and one totalize unit (0 to 999), which records the total number of strokes made on other keys. At 100 increments, totalizing unit rings bell. When totalizing unit records 100, each figure corresponding to individual keys automatically displays percentage. Two reset knobs, removable tabs on top of counter provide area for identification of clasification being counted. See listing in the Photography Section. Special attention was given to the ergonomic form of the folding Checktemp® 4 thermometer, which provides practical temperature measurements while fitting comfortably and securely in your hand. The fast responding, fold-away probe is made of high quality, stainless steel, enables angled measurements, and can penetrate semi-frozen and semi-solid samples. The LCD on the side of the handle is easy to see and read. As you unfold the stainless steel probe, the Checktemp® 4 automatically turns ON and immediately performs a calibration test and also lets you know if your battery level is low or if your meter requires recalibration. These unique features provide the security of knowing you have accurate measurements. It also features auto shut-off. The Checktemp® 4 comes with battery and instructions. Factory Calibration Certificates: Checktemp® 4 can be calibrated against NIST standards.